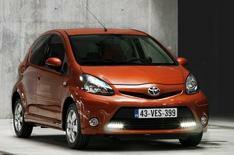 Toyota Aygo cleans up for 2012 | What Car? The Toyota Aygo has been updated for 2012, in line with similar changes to the closely related Citroen C1 and Peugeot 107. The 2012 Aygo incorporates Toyota's latest design language, with a new look featuring a wider front bumper with integrated foglights and a large trapezoidal air intake. LED running lights set into the lower edge of the grille are available as an option. Other changes include dark-tinted rear privacy glass for both three- and five-door versions, and the option of a new metallic orange exterior colour. The 67bhp 1.0-litre three-cylinder petrol engine has been tweaked for average economy of 65.7mpg an improvement of more than 4mpg compared with the current car. More importantly, CO2 emissions fall from 105g/km to 99g/km, which means owners won't pay road tax or the London Congestion Charge. The cabin has also been refreshed, with a new dark grey finish for the upper and lower dashboard and a leather-trimmed steering wheel. Surrounds for the air vents and dials are finished in grey, orange, or black, while the front speakers are trimmed in silver or orange. Toyota says the Aygo's refinement has been improved, thanks to extra insulation under the bonnet and adjustments to the suspension. The car will be launched at the Brussels motor show next week, and goes on sale in March. Prices and full specifications are yet to be announced.